Among all the discussion of the Citroen Cactus, reviewed here, is a small but pleasing detail. 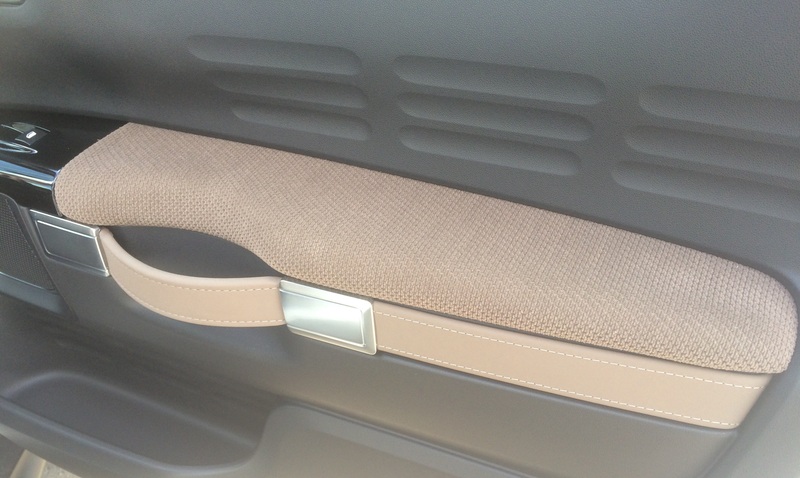 2015 Citroen Cactus arm rest. How nice. I had a closer look at the Citroen Cactus a few days ago and noted the difference made by choosing the warmer colours. While the car is more of a design statement than a design-and-function statement, Citroen should be congratulated for permitting velour to make a comeback. Woven cloths and leather have dominated car interiors for more than a decade. Velour has been absent as a result. But for the Cactus, a small rebellion means that the warm and durable material known as velour is part of the many nice details inside the car. This development is not important in the grand scheme of things yet it might be added to the small stock of reasons to cheer up a tiny bit. The door pull is also rather good. What I am now waiting for is for such cheerfully unnecessary details to find their way into some larger cars. This kind of thing need not be the preserve of “youthful” smaller vehicles. Nice to find the Airbzmp design again in the design of the door covers, the dash vents and the stepping of the leather seats. Concerning the absence of velours (and Alcantara) the reason maybe is the price strategy. For leather (even if it is artifical looking and patial really artificial) you can demand an extra charge. For a more pleasing cloth of a higher quality, this would be more difficult. I regret that too, because there is nothing more comfortable than velour or Alcantara. And it is much more easier to clean than leather. Consumers were convinced leather was always better. Some leather is such as Connolly and Poltrona Frua (and Corinthian!) but a lot is plasticised slaughter house waste. Fabric takes colour better and has a better acoustic quality too. Citroen are taking a bet here. I think some people might really go for it without really knowing why. Cadillac is proud of the fact, that the stitches of their leather seats are not faked (and the leather-parts are actually glued together). So most of the leather seats is partially plastic and with no real stitches. So you buy a lot of illusion for an extra-money….. Some velour, lest we forget, was actually more expensive than the leather option – e.g. in the case of the Mercedes 600 I had the pleasure of taking a seat inside. Daimler kept offering a very expensive velour option for quite some time (apparently catering to a very specific demographic), which explains why I could catch sight of a W124 coupé (that would be a C124 then, nitpickers! )in dark metallic red with dark red velour interior some months ago. A friend of mine recently had the leather seats of his BMW E30 convertible reupholstered, which led me to develop the idea of the average quality of car leather having dramatically decreased. Said E30’s seats had been badly abused, but in some spots the original, very decent quality was apparent. As the friend’s other car is a BMW E60, I can safely say that the more modern car’s hide is simply dreadful and in no way comparable to the old Three’s. Maybe it’s the increase in leather seats as standard equipment that has made it necessary for manufacturers to resort to cheaper/nastier/more abundant (?) fare? I was in France for over a week over Easter – it has given me a couple of subjects about which I hope to find time to write – and was quite shocked at …. the absence of Cactii on French roads. It is being trounced by the 2008, the Captur and others (I think it made 22 in the sales listings in February). It does now outsell the C4 (which has bombed), and the C3, C5 and C4 Picasso are also on the slide. Funnily, I am warming to the little beast a bit more – maybe it will prove to be a slow burn. SV. I made just the same point when I returned from France last month. One Week. One Cactus. I was so convinced it would be a big seller. One problem with the DS range/marque is that a Citroen that isn’t a DS is maybe now viewed as lacking cachet. I still sometimes try to think well of the Cactus, but then I remember a damning review I read of it by …. now what was his name? I remember thinking the same thing about the Twingo MkIII and the relative absence thereof when I was in Paris for Christmas. But I think it has more to do with the time lapse between launch and first deliveries, and I’m guessing manufacturers don’t build huge stocks prior to launch the way they used to – likely because they offer more options and variations nowadays, and there are more cars made to order. Cacti sell well here in Denmark. I couldn´t say how well relative to Capturs which seem remarkably popular. The sales of the Cactus are around 60,000 so far. SV. Yes, actually I remember that it was a fair appraisal. Since then I have just bundled your qualified disappointment with my own stronger dislike when I finally sat in one. The interior seemed an unacceptable compromise of the designer’s original intentions and, particularly, I remember the intrusive bulkhead by my brow from the (not so clever after all) overhead air bags. I really wanted to like the car. Maybe I’ll have another look at one again. Sean – I could not agree more, i too really wanted to like it, and whilst I found things to like, I got (and still do) irritated by some of the stupidity of the design compromises which are, I believe, mainly driven by the desire to reduce production costs. There is not enough good in to to enable me to live with the stupid stuff (ironic I know, given the amount of stupid stuff of which a C6 is guilty, but that was just a case of love at first sight).